The 2013 NFL Combine is now in the books. We continue with our recaps of the top players at every position. Today we discuss linebackers. These aren’t your daddy’s linebackers. Linebackers in today’s NFL have to have some speed and ideally be able to either rush the passer or drop back into coverage. NFL teams aren’t interested in a player that can only contribute on 1st and 2nd down. Even the middle or inside linebackers can’t just be run stuffers, they must be able to make contributions in pass defense. If a linebacker can’t be on the field on 3rd down, then he’s a deficiency. With so many college teams running spread offenses, many college teams are moving safeties to linebacker to get more speed on the field. These former defensive backs can really run well and in most cases are able to do a good job dropping into coverage. Jon Bostic-Florida (6-1 245 lbs. ): Explosive middle linebacker. Ran a shocking 4.61 40 which is the fastest for an inside linebacker at the Combine and the 3rd fastest of all linebackers. His 6.99 3 cone drill tied for 3rd best among linebackers and his 4.24 short shuttle was 4th best. Bends well and stays low. Looked extremely smooth in on-field drills and showed excellent lateral movement. Definitely improved his draft stock with this workout. Jamie Collins-Southern Miss (6-3 250 lbs. ): Played defensive end in college, but should convert to outside linebacker in the NFL. Blew the roof off Lucas Oil Stadium with his 11’7” broad jump which is an all-time Combine record. Did very well in the other measureables, running a 4.64 40 yard dash, vertical jumping 41.5” which was almost a record, and a 7.10 in the 3 cone drill. The broad jump and vertical jump show that he has very good lower body explosion. His on-field drills also looked good and he showed an ability to cut very well. After this workout, teams will have to go back and study more tape on him. Zavier Gooden-Missouri (6-1 234 lbs. ): Former safety that will likely play outside linebacker at the next level. Ran the fastest 40 time of the linebackers, a 4.47. Bench pressed 27 reps, broad jumped 10’11” (2nd best LB), 6.71 3 cone and 4.18 short shuttle were best among the linebackers. Has the ball skills of a defensive back. Runs well and looks very smooth on the field. Should be able to contribute right away in nickel packages. Had a very good workout. Khaseem Greene-Rutgers (6-1 241 lbs. ): Former safety that chases the ball sideline to sideline. Likely to play outside or possibly on the inside in a 3-4. Has over 380 tackles in his 4 year career. Gets in and out of his breaks very well. His measureables weren’t outstanding, but he did very well in the on-field drills, looking very smooth. Jarvis Jones-Georgia (6-2 245 lbs. ): Dominated as a 3-4 outside linebacker at the college level. Explosive player that always seems to be around the ball. Did not participate in any of the drills for the Combine. Will be under a ton of pressure to perform well at his pro day. Also has a neck issue that may keep him off of some team’s boards. Kevin Minter-LSU (6-0 246 lbs. ): Fluid inside linebacker. Explosive lower body. Moves well in and out of his breaks. 9’11” broad jump and 25 reps on bench press. Able to move well in traffic and in trash. Is able to stay on the field in nickel packages. Sio Moore-UConn (6-1 245 lbs. ): Outside linebacker that is having a good offseason. One of the few players that played in both the East – West Shrine Game and the Senior Bowl, playing very well in both games. Built on those games with a good Combine and has to be improving his draft stock. Has strong lower body. Looked good in pass rush drills. Ran a 4.65 40 (5th best LB), 38” vertical (3rd best LB), 10’7” broad jump (4th best LB), 29 bench press reps (2nd best LB). Opening some eyes of NFL scouts with his performances. Alec Ogletree-Georgia (6-2 242 lbs. ): Athletic inside linebacker that is a former safety. Understands passing lanes and how to interrupt the flow of the passing game. Runs well. Flexible hips. Looks very fluid and easy when running. Ran a 4.70 40. Likely the first inside linebacker taken but could also play on the outside if needed. Johnathan Stewart-Texas A&M (6-4 242 lbs. ): Tall inside linebacker. Has good instincts and has the height to see the play develop. Does a good job shooting the A gap to make plays in the backfield. Had a good day. Ran a 4.68 40 yard dash and looked very smooth on the field. 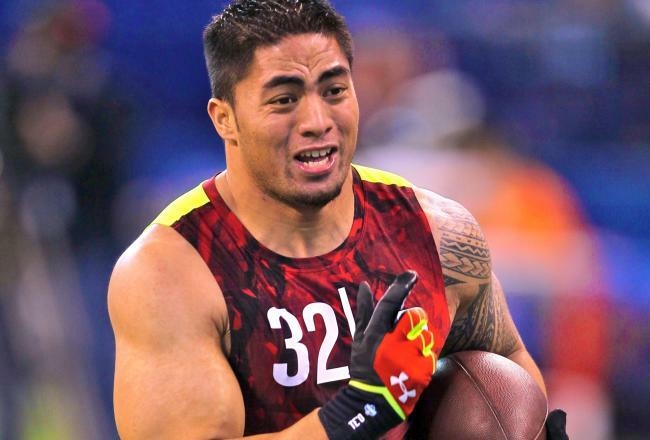 Manti Te’0-Notre Dame (6-1 241 lbs. ): Everyone wanted to see Te’o and see how he would handle the pressure after all the media attention he has gotten. The teams that interviewed him said he was a rock star in the interview room. He however, had a disappointing workout. Only ran a 4.82 40 and he looked like he has a lot of wasted movement in the early part of field drills. He looked like he loosened up as the day went on. Has good lateral movement and quick feet. He likely was trying too hard to make an impression. Will probably look better at his pro day. He is also the kind of player that looks better with pads on than in shorts. Cornelius Washington-Georgia (6-4 265 lbs. ): Georgia had several pro prospects on defense, but Washington is sneaking up on all of them. Had a great week at the Senior Bowl and created a buzz at the Combine. Measurables were off the charts-4.55 40 (2nd best LB), 36 reps on the bench press (best LB), 39” vertical (2nd best LB) and 10’8” broad jump (3rd best LB). I thought he was more of a 3-4 end, but now I think he might be able to play outside linebacker (he did both at Georgia). Very strong player that is able to shove the blocker back into the backfield. He is definitely a player that NFL teams will be watching more tape on. This entry was posted on March 7, 2013 by draftmaniacs in Uncategorized and tagged 2013 NFL Combine, 2013 NFL Draft, 2013 NFLDraft, Alec Ogletree, Cornelius Washington, Georgia football, Jamie Collins, Jamie Collins broad jump, Jarvis Jones, Khaseem Greene, Mani Te'o, Missouri football, NFL, NFL Draft, Notre Dame football, Sio Moore, Zavier Gooden.